MSD’s team of engineers have been hard at work during the past year improving the Multiple Spark Coils for the GM LS-engine system. The newly designed coils replace OEM coils, but they can deliver a more powerful spark to the plugs, in combination with multiple sparks at idle. Boosted spark voltage and power, and the capacity for multiple sparks, help refine the combustion of fuel to yield a more efficient burn. This creates better throttle response, quick starts and smooth idling, in addition to better high-RPM performance! The MSD Coils come in three different housing types. Make a visual match with your application. Want to change out your old LS coils with an upgrade that is more efficient? 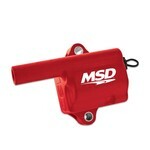 The new MSD Blaster LS Coil line is perfect for a modern GM muscle car or truck. These LS coils are made to be a bolt-in replacement, but they have been extensively tested and detailed by the MSD engineering team. The increased efficiency of these Blaster Coils will deliver a great ignition boost to your LS. Looking for an effective performance upgrade for your daily driver? The Street Fire line of performance LS Coils are the answer! MSD engineers spec’d the internal components of these coils to deliver increased spark energy over the entire RPM range of the engine. The coils bolt in place of the factory units and accept OEM connections for a simple installation.